Stuck with your old style mob? Wanting an easier product to clean your house? Then you probably need to open your eyes and see what the futuristic technology held upon you. In the cleaning aspect, there is a new kind of mop which is called spinning mop. This spinning mop is generated from the needs of the comfortable cleaning technology which won’t hurt your body when using it. Here is a good brand spinning mop, the Hurricane. Hurricane Spinning Mop is made base on the standard Centrifugal Drying Technology which is the reason why your mop will dry in no time. It has many features which resemble the modern technology product, one that known as the best one is the 360-degree swivel head which can cut the cleaning time in half. Hurricane Spin Mop can be a better choice for your cleaning activity because of its smooth and neat result which has changed the world of cleaning entirely. So if you are interested in learning more about Hurricane Spin Mop, let’s see the explanation below. There are many features in Hurricane Spin Mop which provide you a neater and easier way of cleaning. First, Hurricane Spin Mop has the 360-degree swivel head which enables you to reach every small place that you want to clean. It is also equipped with the pivoting ability which makes you easier to rotate this product. After that, it has the patented bucket with the Centrifugal Dryer Technology which help you to remove the excess water without needing too much effort. 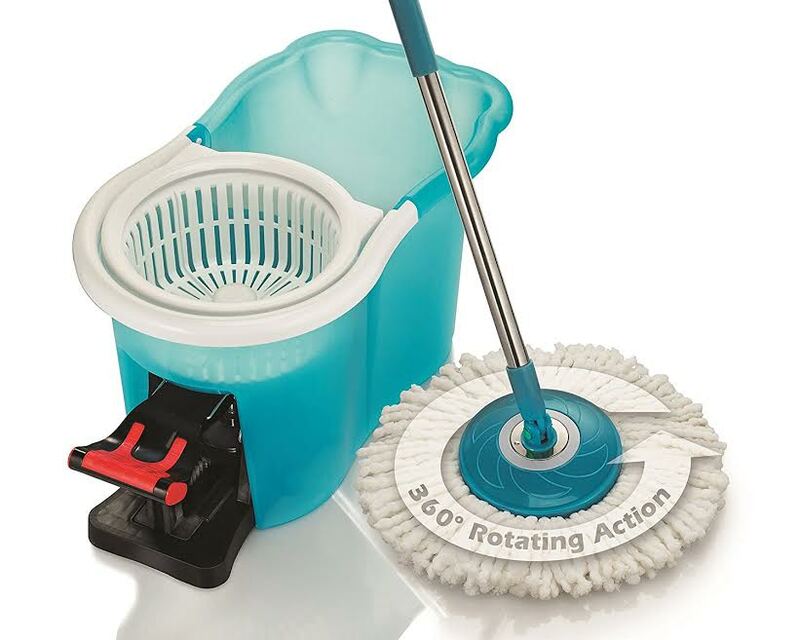 Hurricane Spin Mop itself is made from the microfiber material which has the ability to absorb 10x of its own weight. This material is also making your work doesn’t leave scratches, streaks and doesn’t drip. It will leave no trace in cleaning, and the smooth texture makes the effort that you need is lower than the usual mop. Take a look: Hurricane Spin Mop vs O Cedar. The performance of the cleaning items are usually marked from its efficiency, durability, and how hard to handle it. In this case, Hurricane Spin Mop is quite bad in all these aspects. Despite the fact that the design of Hurricane Mop is beautiful and simple, but its materials are pretty easily broken. The company has proclaimed that Hurricane Spin Mop will shine in the market, but in reality, Hurricane Spin Mop is just beautiful on the outside. The bucket pedal and mop handle are using a bad standard material which is why both are easy to break. There are a lot of downside on this item, but there is also some that good like its spinning ability which can reach 1000 rpm, this one is good for a cheap cleaning stuff. But still, in overall Hurricane Spin Mop is not like what people expect to be. In overall, Hurricane Spin Mop is not the best cleaning product out there. There are many products on the market that exceed the quality that Hurricane has. That’s why you probably need to reconsider it if you want to buy this item because the durability is quite bad.